In this addictive dish made on a grill pan, Arab-Sicilian flavors of pistachio, vinegar, and mint transform humble zucchini into something you’ll long for again and again. Be sure to make your zucchini slices thick in order to achieve the preferred doneness—juicy, somewhat soft to the bite, just cooked through, and with a little bend to them (they’ll soften more as they rest). You can also cook the zucchini strips in a preheated regular cast-iron pan over medium heat for 3 to 4 minutes per side or on a grill. To keep the arugula perky, add it just before serving. Slice the zucchini lengthwise into 1⁄3-inch-wide strips. Preheat a grill pan over high heat for 5 minutes. In a large bowl, toss the zucchini strips with 1 tablespoon of the oil, 1⁄2 teaspoon salt, and a grind or two of pepper. 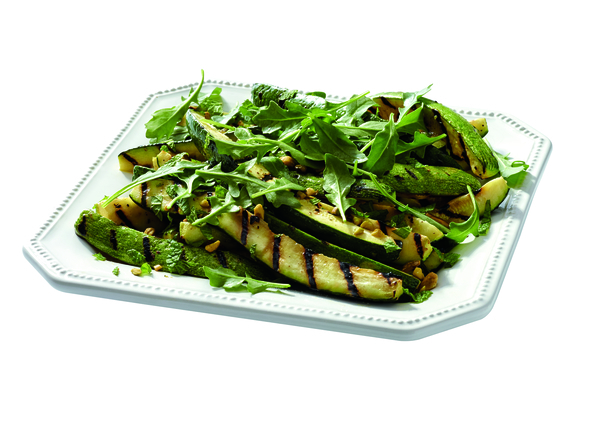 Working in batches, grill the zucchini for 4 to 5 minutes, turn and grill until tender and well marked, 4 to 5 minutes more. Remove the zucchini from the heat, mound it on a baking sheet to gently finish cooking, and let sit for 10 minutes. Whisk together the vinegar and remaining 3 tablespoons oil. Transfer the zucchini to a platter. Drizzle with the vinaigrette, sprinkle with the pistachios and mint, toss lightly, season to taste with salt, garnish with arugula, and serve.